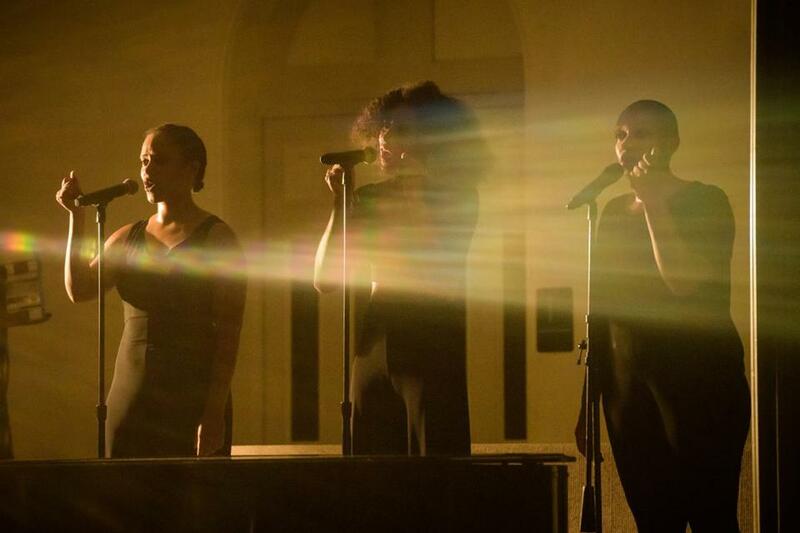 In one portion of “What Remains,” the performers evolve into a swaying girl-group trio. “What Remains” is the title of the 65-minute performance piece by Claudia Rankine and Will Rawls that the Institute of Contemporary Art presented this weekend, a Summer Stages Dance @ ICA/Boston project. It’s also a springboard for thought both during and after the show. What remains after the official abolition of slavery? What remains when words and movement are deconstructed? What remains when you leave the theater? Claudia Rankine’s five volumes of poetry include “Don’t Let Me Be Lonely” and “Citizen: An American Lyric.” She is a 2016 MacArthur Fellow, and last year ArtsEmerson presented the American Repertory Theater production of her play “The White Card” at the ArtsEmerson Paramount Center. Will Rawls is a writer, choreographer, and performer who won the 2017 Bessie Award for outstanding emerging choreographer. “What Remains” premiered at Bard College in April 2017, as part of “We’re Watching,” a four-day exhibition focused on the theme of surveillance. But then the quartet disperses and the harmony dissipates into mutterings and speeded-up repetitions accompanied by labored movement, as if the performers were learning to move and communicate all over again, starting from scratch, building their identities from the ground up. And the theme of surveillance becomes secondary to oppositions like white vs. black, man vs. woman, state vs. citizen, word vs. body, audience vs. performer, and, most of all, I vs. you. Direction and choreography by Will Rawls. Text by Claudia Rankine. Costumes, Eleanor O’Connell. Sound, Jeremy Toussaint-Baptiste. Music by Jeremy Toussaint-Baptiste, with Will Rawls. At the Institute of Contemporary Art, Barbara Lee Family Foundation Theater, Friday, April 12.